The Tablet List and Details HTML screen template is part of a collection of advanced screen templates for Visual Studio LightSwitch HTML Client and Cloud Business Apps (see below). The Xpert360Lightning,WebExtensions extension is bundled with AIDE 2013 for Visual Studio for now and is not available separately though this may change (see below for more information). The purpose of this template is to provide a means of generating a List and Details screen for larger form factor devices such as tablets or desktops. 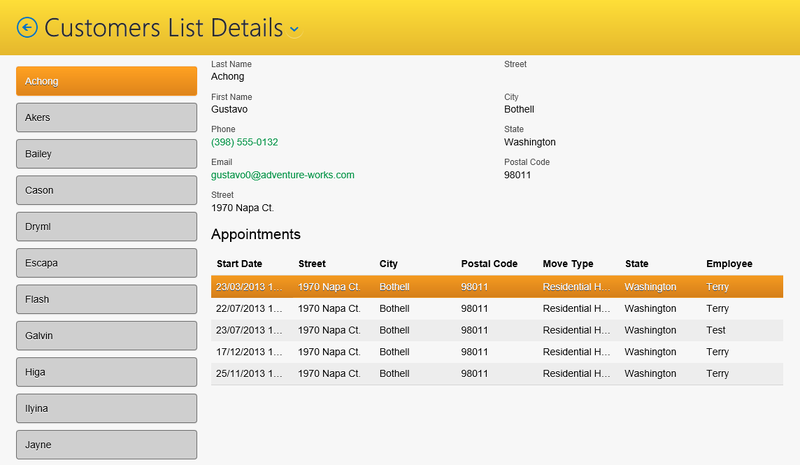 The generated screens are similar to those created using the Rich-Client List and Details template (Silverlight client). You can create screens like this manually starting with the simple default Browse Data template however this new template will save you a considerable amount of time and provide consistent results. 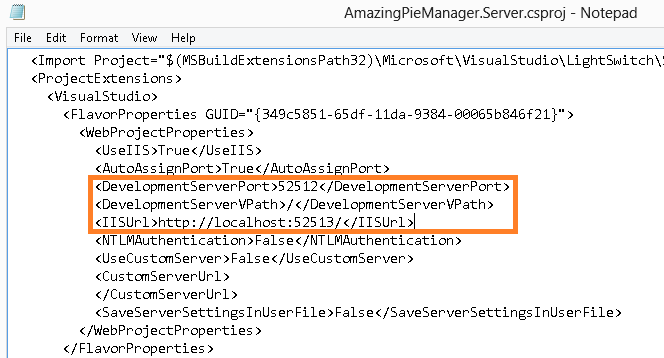 The default screen name is ‘ListDetails’ and the primary collection name is prepended. You select screen data as usual in the main dialog including the primary collection and optionally the primary entity-type details and related child collections. This screen style is useful for generating a list of master records and displaying them side-by-side with the selected master detail record and a collection of related child data. The screen is generated with one tab. If you choose more than one child collection then you may wish to customize the screen and move some collections to additional screen tabs especially if they contain lots of data. The child collections are generated as grid views but as with all LightSwitch screens you are free to customize it once generated. The master details are displayed in two columns to make better use of space. If any details data contains many properties you will notice that a manageable subset of is added to the screen contents. This will save time when dealing with entity-types with many tens or even hundreds of properties. Trying to display too many properties often makes little sense, is not a good user experience and slows down the LightSwitch screen designer. 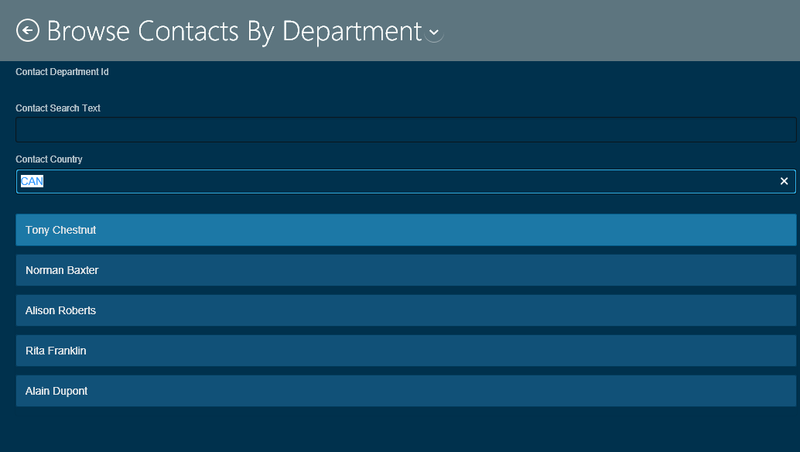 We find this really helpful when connecting to data such as that in Dynamics CRM where tables are wide and complex. You will need to customize the subset of properties displayed but the overall experience is preferable to that provided by the standard templates. If you choose a parameter-driven custom query then the list will be a simple filterable collection. With appropriately designed custom queries this makes for easy generation of a searchable list view as your screen starting point. The template will automatically configure item-tap navigation if you have pre-selected any default screens for a child entity-types. The drill-through navigation to details screens is wired-up and displays modal-dialogs or launches the SPA detail screens. 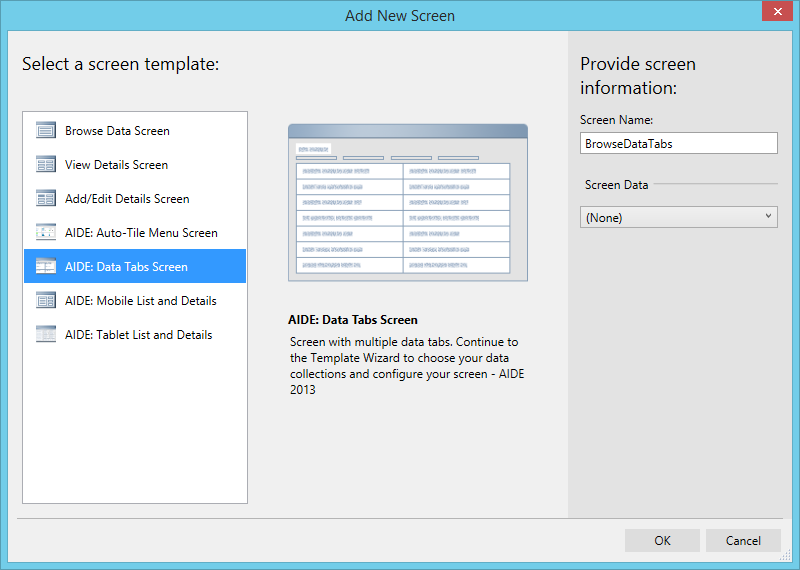 The template looks after the screen content metadata to configure scrolling regions. So when you scroll through the master data list the selected details stay in view. There you have it, a ubiquitous List and Details HTML screen template that gives you a better starting point. A nice productivity boost that we like lots! There are plans to improve this template. We explored the idea of using a template wizard as in an advanced configuration mode to choose the view types (list, tile, table) and placement (main tab, child tab, pop-up dialog). We have experimented with generating more code to display child collection record counts. We will take into consideration all feedback along with these ideas. 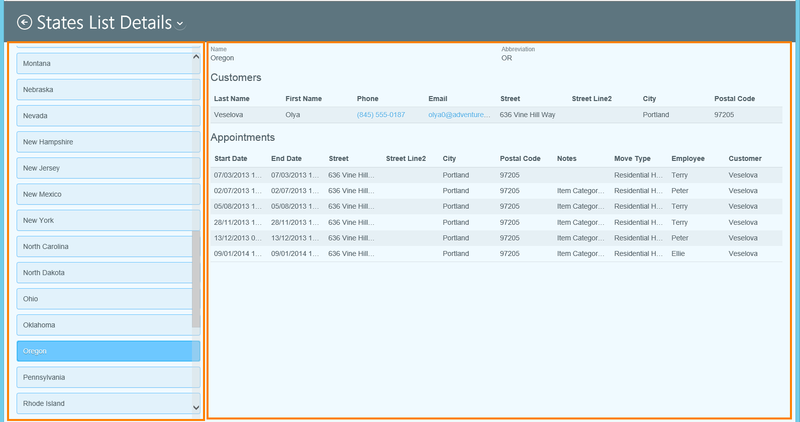 We are open to the idea of providing advanced screen templates for all existing and future LightSwitch client types though the initial focus is on the Mobile-Web client. We are currently working on new screen templates to expand this collection. The screen generated from this template dynamically discovers all screens and creates a navigable menu. Functionality indicated by color-coding and icons. Ideal time-saver when used as your start screen during development or prototyping. Similar to the in-built simple browse screen template but generating tabs based on multiple independent collections. Supports parameter-based queries to generate search pages. 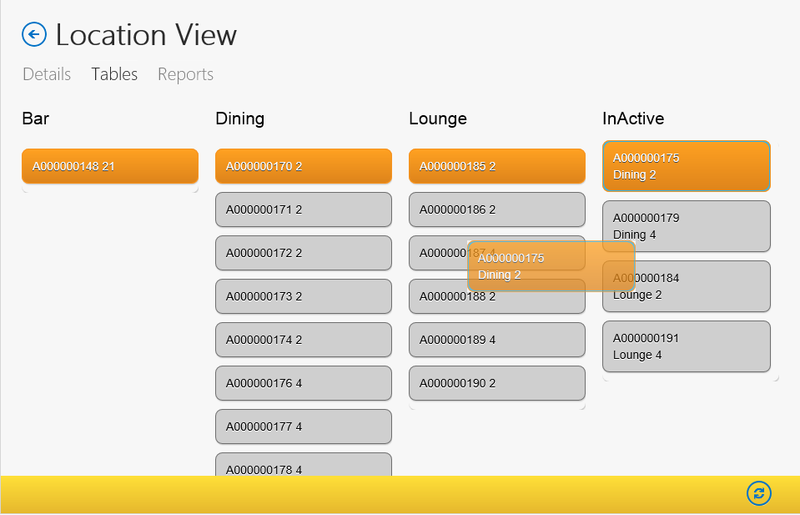 Choice of default collection views from tile view, list view and grid view. Implements tap-through navigation to entity type default screens or discovered view or maintenance screens. An essential list-based master and details screen template. 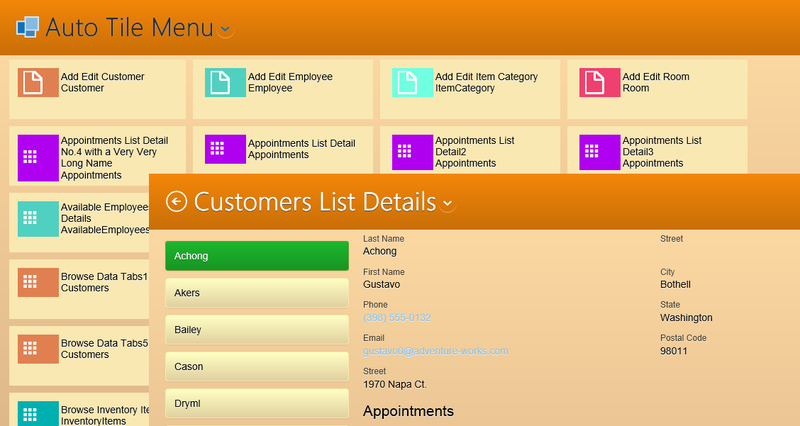 A cross between the in-built simple browse screen template and the Rich-Client based List and Details screen template. Generates an independently scrolling list view side-by-side with selected dual-column entity details data. Extended keyboard support. Generates child collections in detail grids. Implements tap-through navigation to entity type default screens. Limits the number of master details and child details properties displayed for easier customization. Useful list-based master and details screen template. 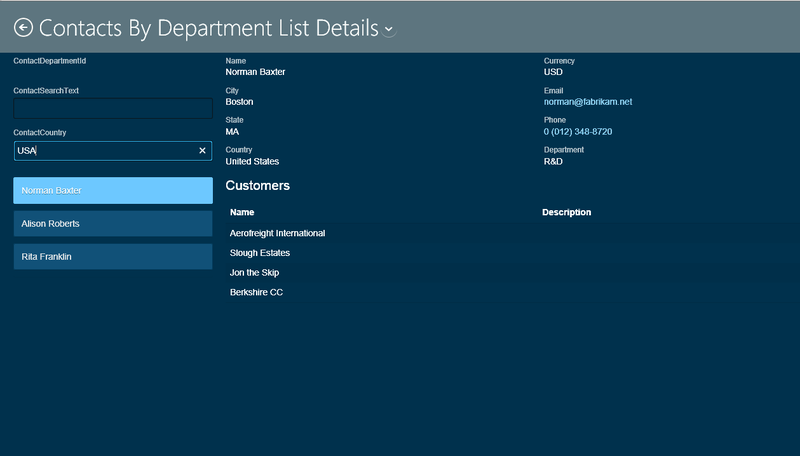 A cross between the in-built simple browse screen template and the Rich-Client based List and Details screen template. Generates an independently scrolling list view side-by-side with selected single-column entity details data. Extended touch and keyboard support. Generates child collections in tabs. Implements tap-through navigation to entity type default screens. Limits the number of master details and child details properties displayed for easier customization. 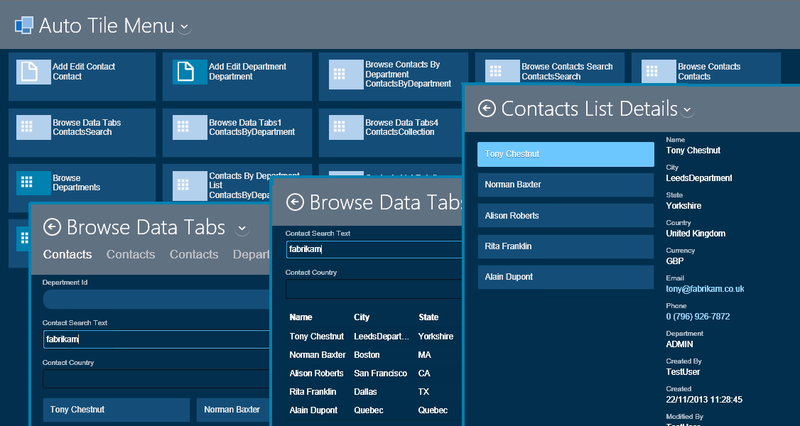 Visual Studio 2013 introduces a new application type called a Cloud Business App. This brings together LightSwitch RAD platform and Office 365. 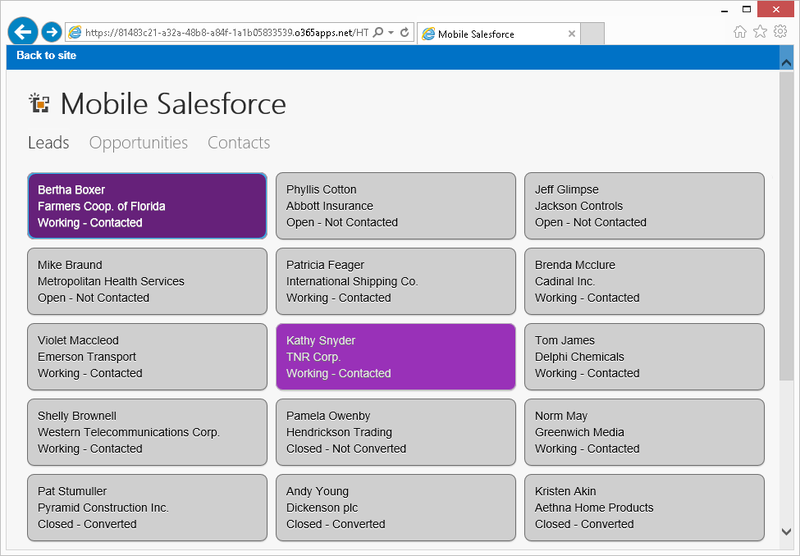 The Cloud Business App template adds SharePoint and Office 365 into the mix. The ease of use is improving as better integration arrives as other components such as the Windows Azure SDK catch up. Will 2014 be a big year for Cloud Business Apps? Building LOB applications on Microsoft’s platform is in some respects harder and more complex today than it was a decade ago, and looking ahead, Office 365 and Azure are a strategic platform for Microsoft. Simplifying LOB app development and deployment to support diverse devices is surely a winner. AIDE 2013 is the market leading set of productivity power tools for Cloud Business and LightSwitch applications. The only supported way to clone, import/export, local backup/restore screens and code. 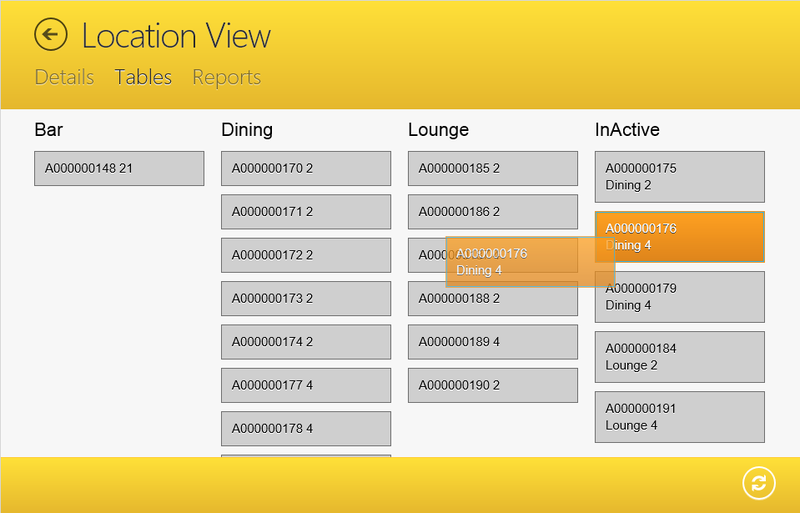 Visualize hard-to-access metadata to complement working with the standard LightSwitch designers. Failed upgrades, unloadable projects, old extensions, AIDE for LightSwitch will be there to help you through! Xpert360 consultants have real-world experience of reconstruction and resurrection of corrupt projects. Contact us if your need help troubleshooting your LightSwitch projects. Company information: Xpert360 Ltd, founded in 2009, based upon three decades of IT experience, is an Independent Software Vendor and Custom Solution Provider based in the United Kingdom. 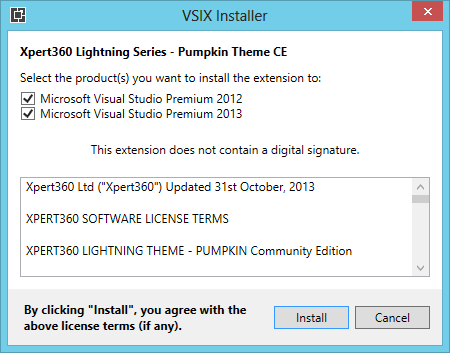 “Xpert360 Lightning“, “AIDE for LightSwitch“, “AIDE 2013 for Visual Studio” are trademarks of Xpert360 Ltd, copyright 2012 – 2014. 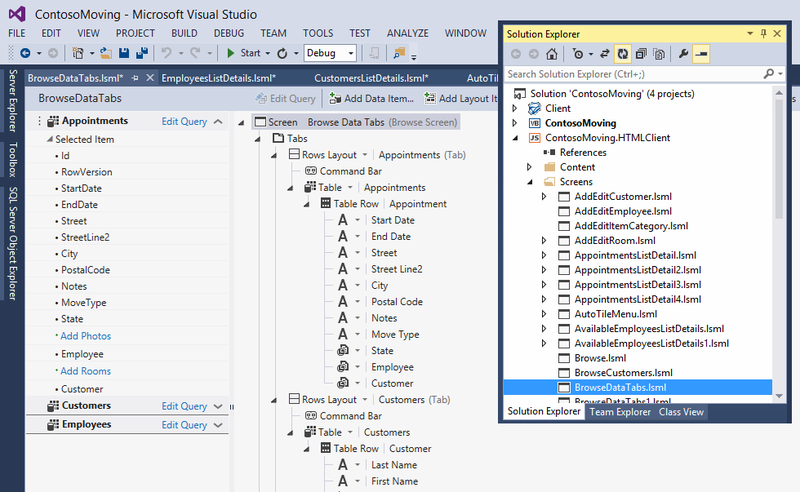 The HTML Browse Tabs screen template is part of a collection of advanced screen templates for Visual Studio LightSwitch HTML Client and Cloud Business Apps (see below). The purpose of this template is to provide a means of generating a browse screen showing multiple collections of data in separate tabs. This style of screen is useful as a hub screen for navigation. During development, especially when prototyping, this screen allows you to build hubs with automatically configured tap-through navigation links. Whether used in prototyping or the final app using screens generated from this template will save you substantial time over using the standard templates. The template is accessible from the ‘Add New Screen’ dialog. The default screen name is ‘BrowseDataTabs’. 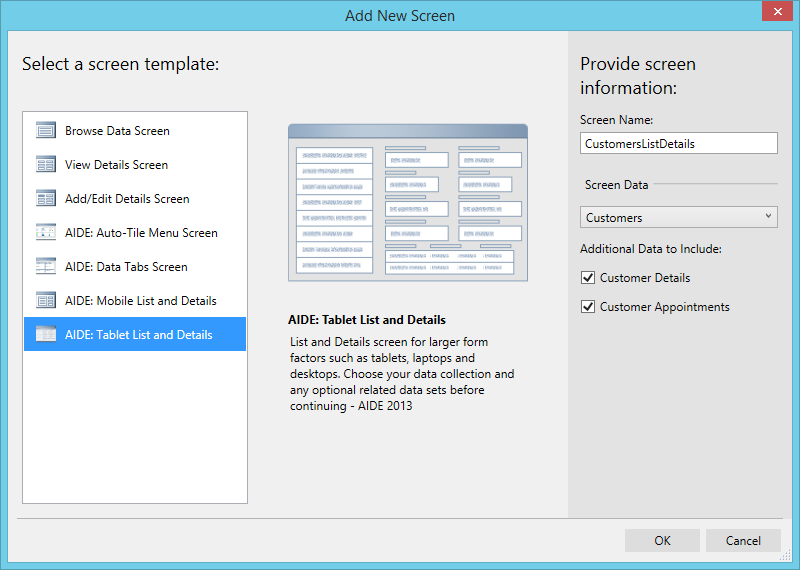 There is no need to select screen data in the main dialog as the template has its own template wizard dialog to choose data collections and configure the screen options. Generate screens as navigation hubs with automatically configured item-tap handlers to default screens or auto-discovered view or maintenance screens. The screen is generated with one tab for each selected entity-set collection. If you choose a parameter-driven custom query then the tab will be a simple filterable collection. With appropriately designed custom queries this makes for easy generation of searchable list, tile and grid views that are working straight after generation. 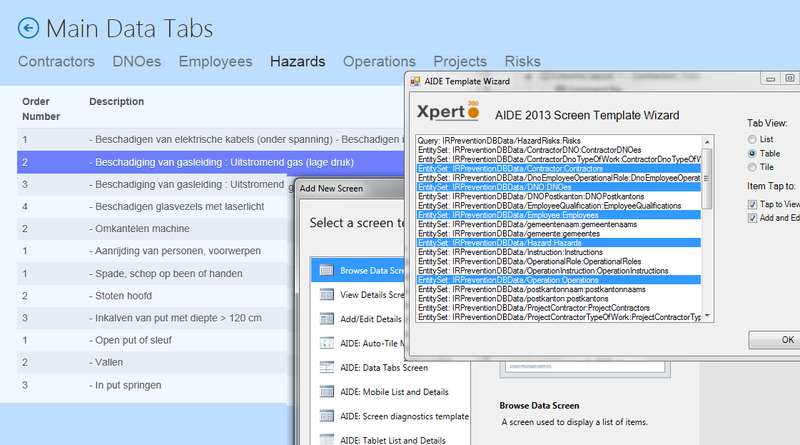 Screens generated using the standard Browse Data template require manual customization before working. If you choose any option for item-tap navigation then the navigation through to other screens will be pre-configured for you. This works best if the ‘View’ and ‘AddAndEdit’ style screens are created beforehand. You can pre-select a default screen for any entity-type to pre-determine the navigation links when there is more than one possible screen to display an entity-type. Your choice of collection views is generated so if you prefer to generally use a tile-view or grid-view then choose that. The standard template is only a list-view. As with all LightSwitch screens you are free to customize it once generated. The drill-through navigation to details screens is automatically wired-up and works be they modal-dialogs or SPA window-based screens. 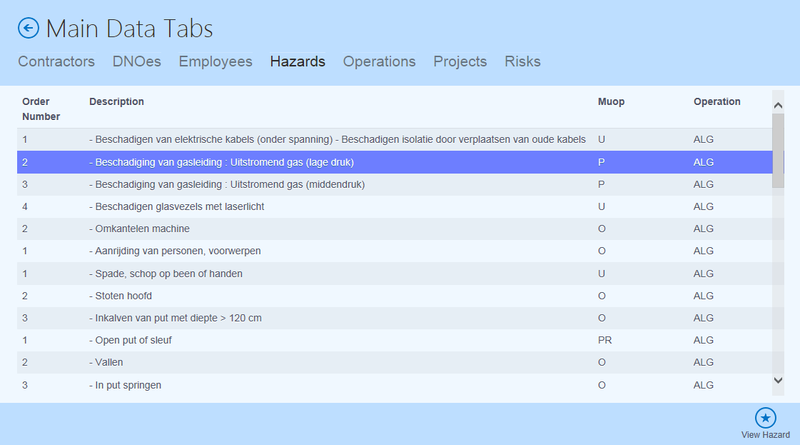 The collection views can be easily adjusted to list, tile or grid after the screen is generated. Any tabs for filterable custom queries will be generated with enterable filter parameters to start you off with a simple working search/filterable collection. 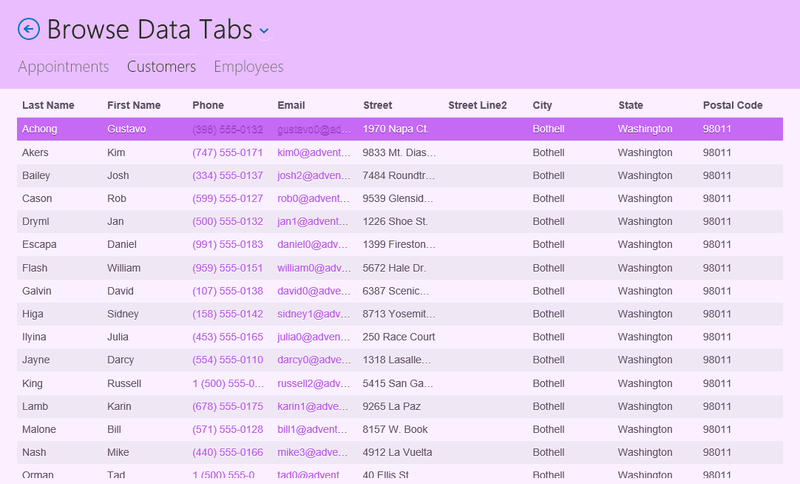 There you have it, a Browse Data Tabs screen template that generates useful hub-style navigation screens, saving you oodles of time. There are plans to improve this template. We explored the idea of using an advanced configuration mode to choose the view type per data tab/collection. We are considering introducing more views to the existing three. We will review this template taking into account any feedback. We are open to the idea of providing advanced screen templates for all LightSwitch client types though the initial focus is on the MobileWeb client. We are currently working on new screen templates to expand this collection. An essential a list-based master and details screen template to boost productivity. 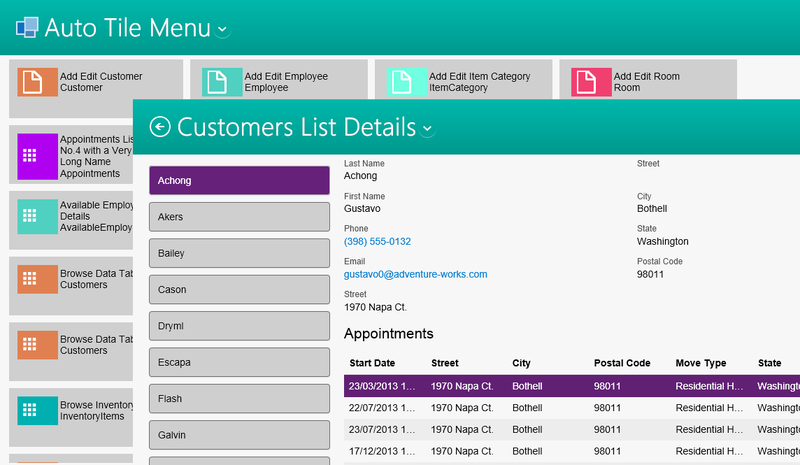 A cross between the in-built simple browse screen template and the Rich-Client based List and Details screen template. Generates an independently scrolling list view side-by-side with selected dual-column entity details data. Extended touch and keyboard support. Child collections in detail grids. Automatic tap-through navigation to entity type default screens. Limits the number of master details and child details properties displayed for easier customization. Useful list-based master and details screen template for mobile devices. 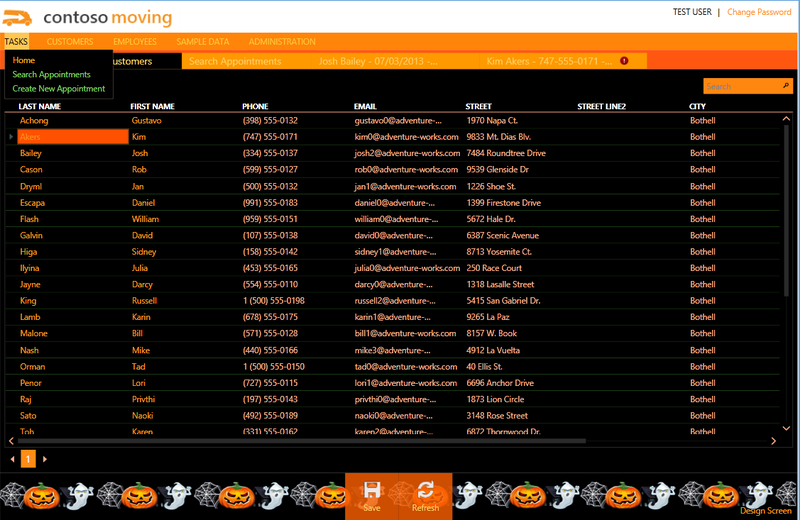 A cross between the in-built simple browse screen template and the Rich-Client based List and Details screen template. Generates an independently scrolling list view side-by-side with selected single-column entity details data. Extended touch and keyboard support. Generates child collections in tabs. Automatically configures tap-through navigation to entity type default screens. Limits the number of master details and child details properties displayed for easier customization. 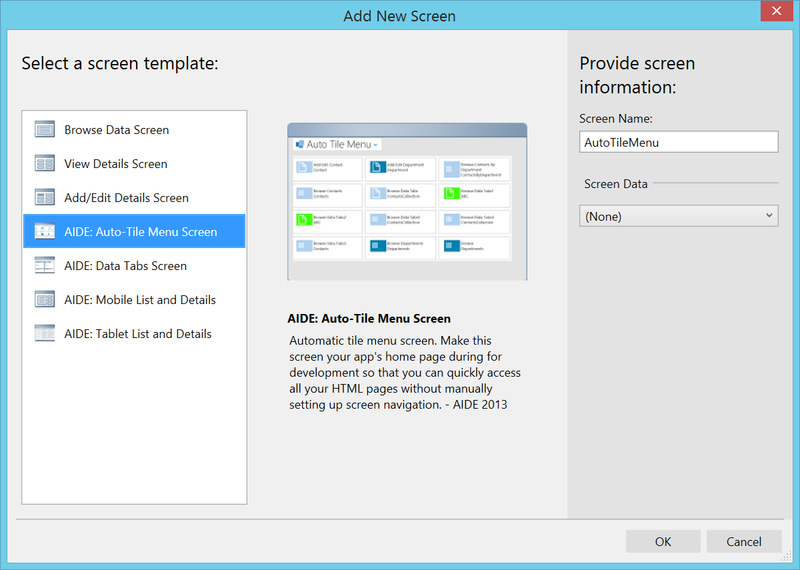 The Auto-Tile Menu screen template is part of a collection of advanced screen templates for Visual Studio LightSwitch HTML Client and Cloud Business Apps (see below). The purpose of this template is to provide a dynamic start menu for project development time. During development, especially when prototyping, this screen allows you to navigate to all screens in the app without continually having to manually configure navigation for browse-type screens. It may surprise you how much time you can save using this temporary starting page. The default screen name is ‘AutoTileMenu’. There is no need to select screen data as this screen is generic. Add one instance per HTML client project and set your new menu screen as the start-up screen whenever you need it. The tiles are color-coded, have different icons and display the screen display name and the name of the first entity screen property. Each tile has one of three icons allocated to it based upon whether the primary screen property is an entity-set, entity-type or no/scalar property. The above example highlights all the screens whose primary screen property is a collection (entity-set). These screens typically can be launched and function well without any parameters (but not always). The tiles have a click event handler for tap-to-navigate and navigate to the appropriate screen. There are no imminent plans to improve this template. We explored the idea of using more of the screen metadata and local storage to add more features. We looked at supporting screen parameters too but opted to keep the screen simpler for now. We will review this template later based on any feedback. An essentially list-based master and details screen template. 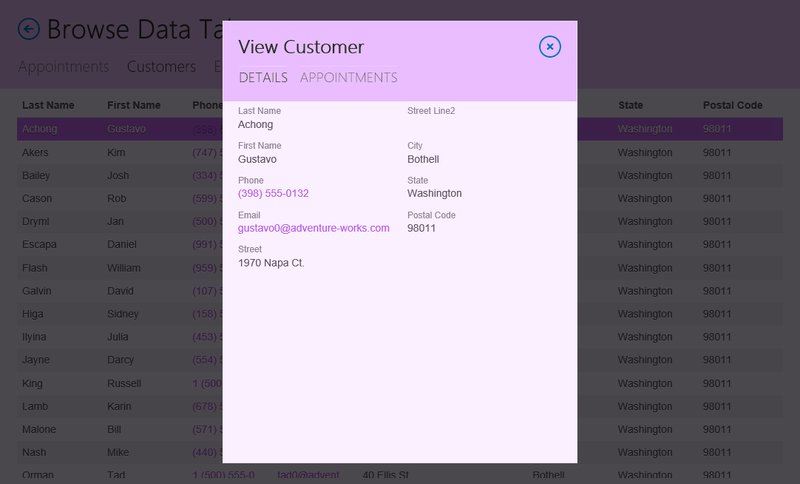 A cross between the in-built simple browse screen template and the Rich-Client based List and Details screen template. Generates an independently scrolling list view side-by-side with selected dual-column entity details data. Extended keyboard support. Generates child collections in detail grids. Implements tap-through navigation to entity type default screens. Limits the number of master details and child details properties displayed for easier customization. 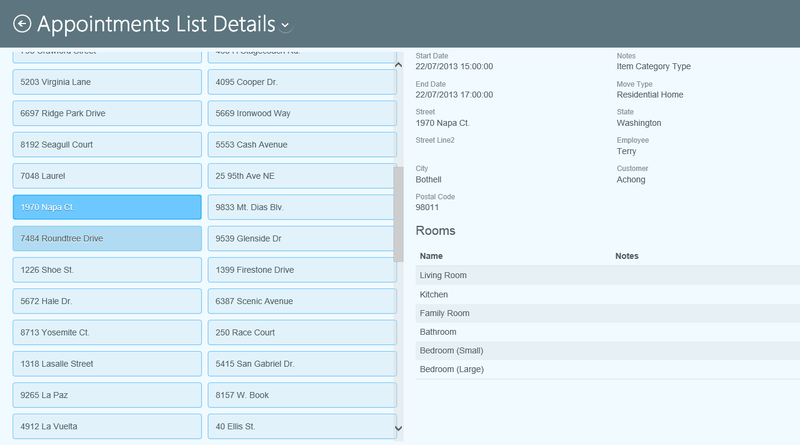 Must have list-based master and details screen template for mobile devices. 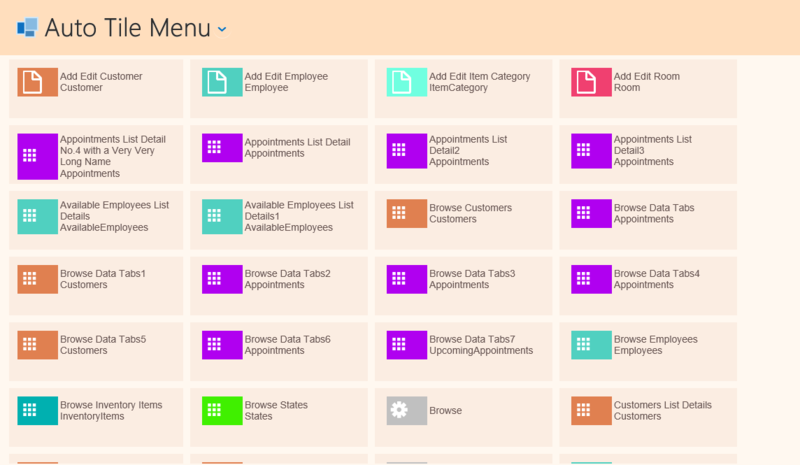 A cross between the in-built simple browse screen template and the Rich-Client based List and Details screen template. Generates an independently scrolling list view side-by-side with selected single-column entity details data. Extended touch and keyboard support. Generates child collections in tabs. Implements tap-through navigation to entity type default screens. Limits the number of master details and child details properties displayed for easier customization. To celebrate the re-release of the Xpert360 theme packs with VS2013 support, Xpert360 have released this free theme based around Halloween with spooky shades of pumpkin with witchy greens and blacks. This theme can be downloaded from here. The theme targets the LightSwitch Silverlight Client v2+ that comes with Visual Studio 2012 and 2013. It has been tested against the LightSwitch Cosmopolitan Shell and the LightSwitch Standard Shell. We have an internal application to import, edit and generate LightSwitch themes to make the work a lot easier and faster. The Cosmopolitan theme contains references to more than 500 colors! The Theme Generator application is itself written in LightSwitch. 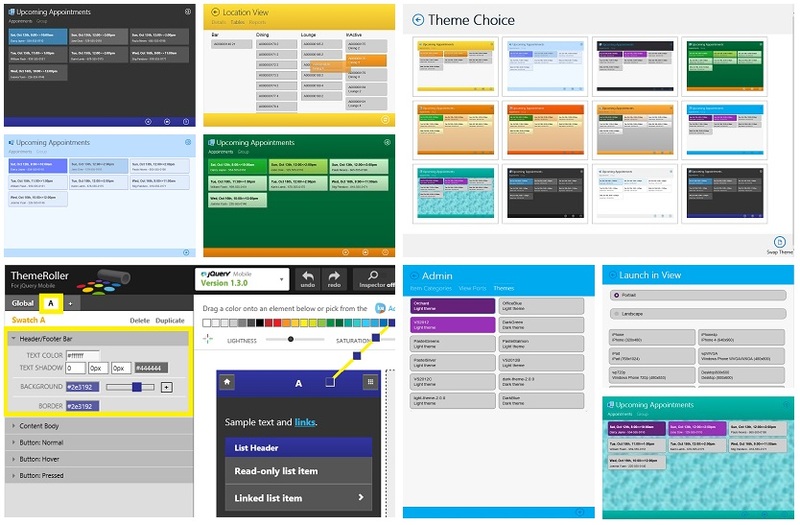 The theme is free and can be obtained from the Visual Studio Extensions gallery. This is the gallery posting – Xpert360Lightning -Pumpkin Theme We hope you like it! “Xpert360 Lightning” and “AIDE for LightSwitch” are trademarks of Xpert360 Ltd, copyright 2012 – 2013. Visual Studio 2013 was published on Friday 18th October 2013. This blog post is the anchor to a series of articles covering the A-Z of themes that we are editing and evolving over time. This article is part of a series of posts from Xpert360 Development Team to address real world scenarios and problems faced when designing, creating and implementing Visual Studio LightSwitch applications. Brought to you by the original and genuine Power Tools for Visual Studio LightSwitch! The LightSwitch HTML Client in VS2013 targets the jQuery Mobile framework and the themes are implemented as Cascading Style Sheets (CSS). The HTML SELECT element is not easy to style and control through just CSS markup. For full control it is usual to use a custom control that mimics the SELECT element by using DIV’s and SPAN’s. The SELECT element popup is implemented outside of the browser. The blue selection rectangle is not controllable in CSS and by default your themes will always be black, white and blue. We will extend the theme mark-up to do better styling in LightSwitch as in the above screen shot. The use of rounded corners in themes can be aesthetically pleasing. The LightSwitch themes need extending to properly support them. The screen shots above show the adjusted rounded corner support. We have an easy implementation of theme swapping and view port selection for different form factors. What are they and how can they be used in LightSwitch HTML applications. Creating dynamic themes and features to integrate with SharePoint and site chrome. It would not be complete without a theme starter pack. The preview containing 19 themes was released soon after the VS2013 in December 2013 and is currently available in a bumper bundle offer of AIDE 2013 for Visual Studio which also include a preview of 4 new Advanced Screen Templates. 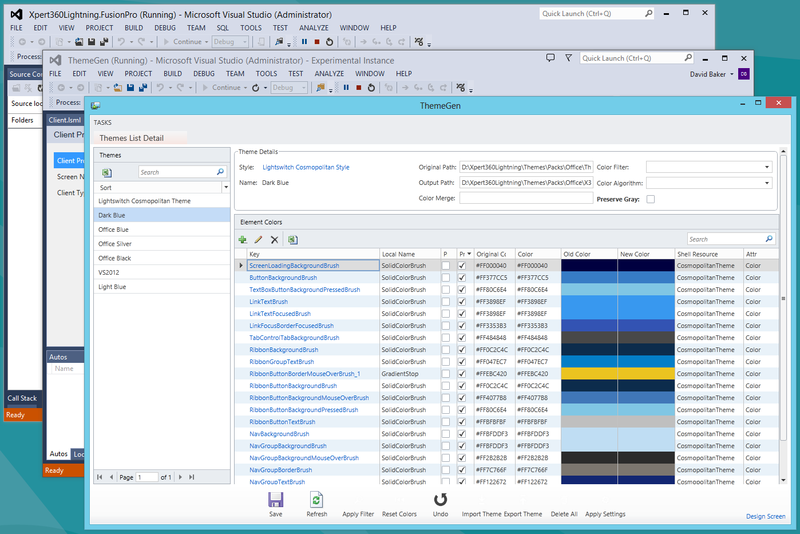 The Visual Studio 2013 RTM was released in late 2013 and Xpert360 joined the party upgrading samples, themes, extensions and tools to support VS2013. We will take you through all the shortcuts and tweaks to give style to your LightSwitch HTML applications and Cloud Business Apps! When Visual Studio 2013 RTW is published (scheduled for Friday 18th October 2013), it will trigger a round of regression testing and final adjustments for third-party Visual Studio tool vendors. Somasegar’s blog article announcing Visual Studio 2013 RC contains a good overview of key features if you are playing catch-up. At the end he mentions the official VS2013 Launch Party is scheduled for Wednesday 13th November 2013. You can see the countdown to launch ticking down there. Our product team is making steady progress towards releasing all our LightSwitch tools and extensions in the same timeframe as VS2013. We needed to try some new VS2013 features and work through implementing some new features in AIDE for LightSwitch and the Xpert360 Lightning Dynamics CRM and Salesforce data adapters. We also needed to upgrade samples, themes and other extensions. 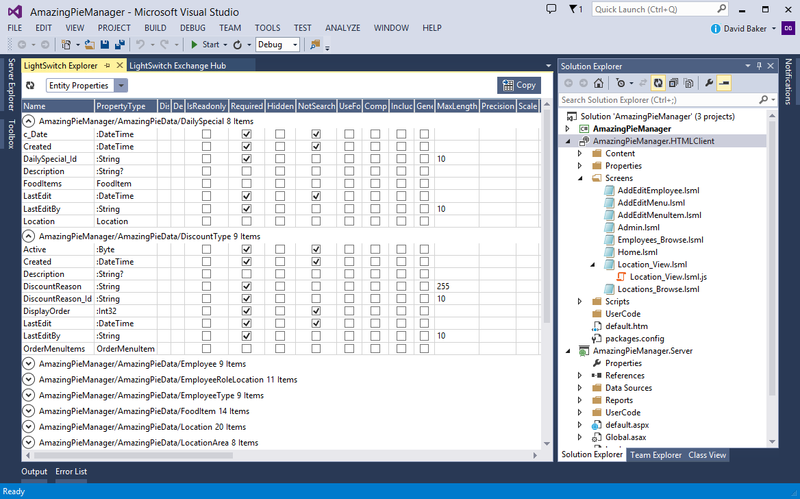 Working with multiple versions of Visual Studio side-by-side has gotten a lot easier over the years. We have machines with VS2012, VS2012 and VS2013 RC. In this instance we needed to debug VS2012 VSIX extensions in the VS2013 RC experimental instance while testing LightSwitch VS2013 applications. Fortunately this works after a few adjustments to debug and VSIX settings. VS2012 VS2013 LightSwitch family photo! So here we have AIDE for LightSwitch running in debug in VS2012 Update 3 launching the VS2013 RC experimental instance then running a LightSwitch desktop application. We thought it was quite cool anyway. 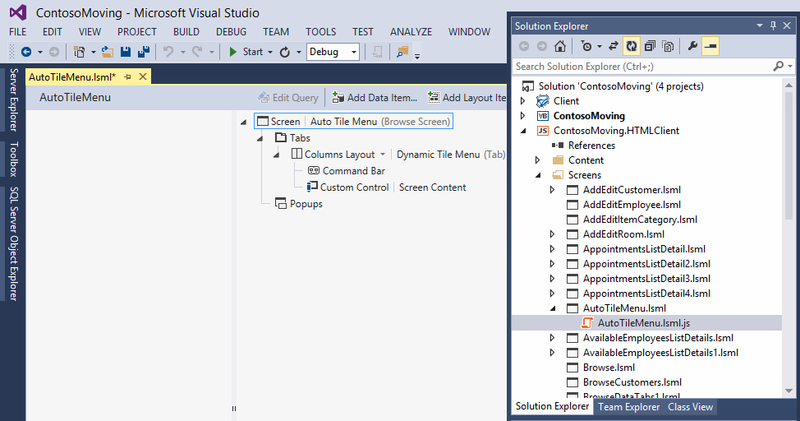 Our LightSwitch Silverlight themes worked nicely with VS2013 Preview but not so with VS2013 RC. Our HTML CSS themes needed some work as the leap from VS2012 to VS2013 RC involved big changes in the LightSwitch HTML Client. We can see that not surprising some of the styling changed but here is a VS22013 RC LightSwitch HTML Client application deployed in Office 365 SharePoint on-line. The JQuery Mobile CSS theme was inspired by VS2012 IDE and sports rounded corners (no big deal really). The other interesting item here is the preview version of the soon to be released LightSwitch salesforce data adapter running in the Cloud. 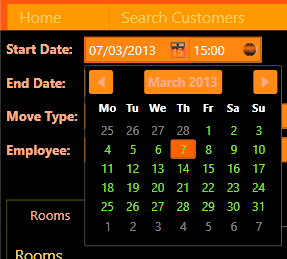 Here is another HTML client application with a theme called ‘Orchard’. Notice the correct rendering of the header after adjusting msls-light-2.0.0.css and msls-2.0.0.js for swatch support. 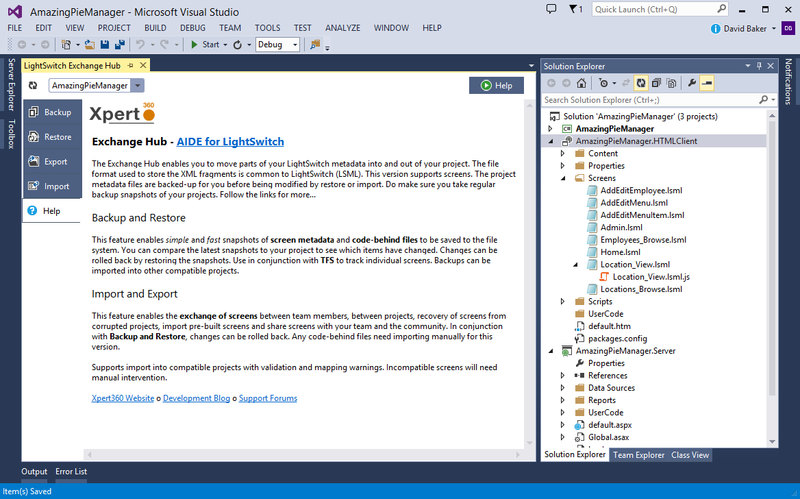 We are adding final touches to the first release of AIDE for LightSwitch for VS2013. The LightSwitch Screen Workbench and Entity Workbench windows are complete too. Xpert360 are providing a free upgrade to the new version of AIDE for LightSwitch for all existing customers. The facility to exchange screens between LightSwitch projects (V1, V2, V3 and V4 projects with a few restrictions) is predicted to be a great help for those users upgrading LightSwitch 2010 and LightSwitch 2012 projects to VS2013. When upgrades fail, projects become unloadable, extensions are outdated, AIDE for LightSwitch will be there to help you through! Our consultants and support staff have real-world experience of tricky LightSwitch project upgrades, including reconstruction and resurrection of corrupt projects. Contact us if your need help troubleshooting. 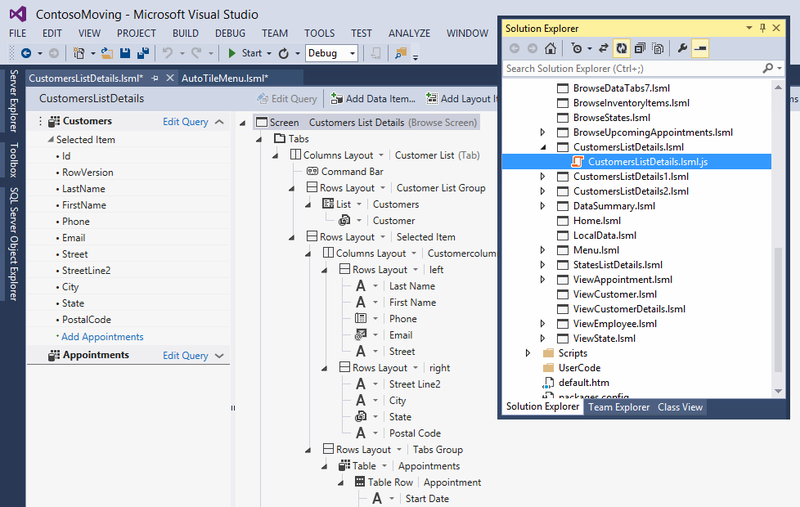 The next Vs2013 update on the blog will be for the VS2013 RTW release next week. We will have final news of all the upgrades and confirmation of release dates shortly afterwards. 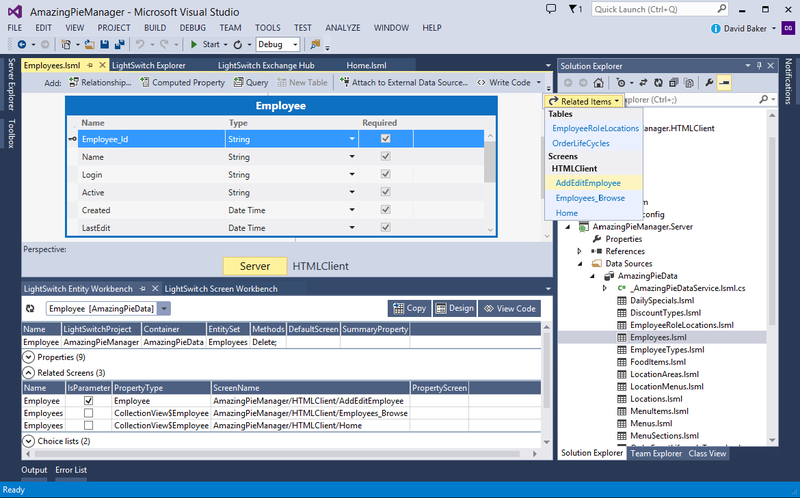 The Visual Studio 2013 RTW date and official virtual launch day are fast approaching. 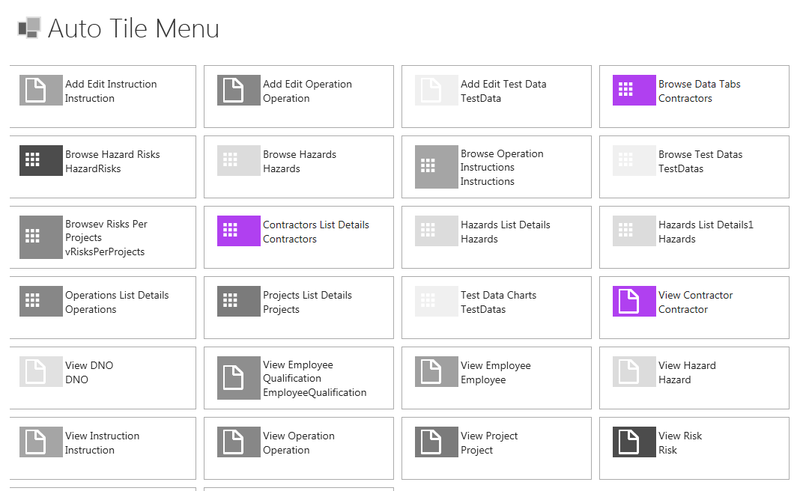 Xpert360 have been busy upgrading samples, themes, extensions and tools ready for VS2013. It is going really well and we eagerly await the launch! Specify Ports after Upgrading LightSwitch Clients to VS2013! I planned to upgrade a LightSwitch HTML client application from VS2012 to VS2013 RC. After the upgrade I would be running the two versions of the project side by side to test and compare. I also wanted to try some new VS2013 features and work through implementing some “Drag and Drop with LightSwitch HTML Client” as described by Rohit Agrawal on the Visual Studio LightSwitch Team Blog. Go read the post if you have not yet done so. So here I create a standard View Details Screen for the Locations entity. I wired-up some views of the Tables entity and added the drag and drop code. Some more work to do, but as this is VS2012 and the new ‘.refresh‘ method is in VS2013 I upgraded a copy of the project. The upgrade process took a minute and the project rebuild worked. The application runs fine, still a bit of work to do. We can see that not surprising some of the styling changed and some customizations need attention. Now the Refresh button on the command bar works. 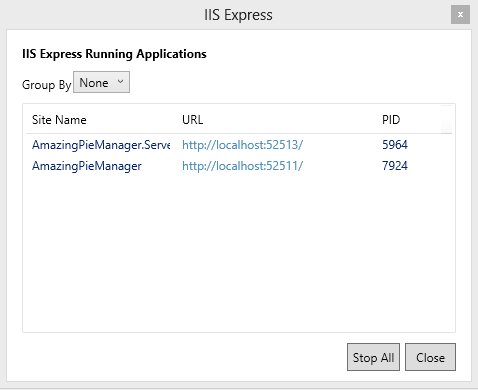 I resolved the conflict by changing the Development Server Port and the port for the Web site in IIS Express. Then I continued testing side by side with no problems. All is well here in IIS Express with the two projects running and being concurrently debugged. This particular feature affects the Rich Client Silverlight clients and the HTML Mobile Client varieties. As we are often copying projects and switching between versions of Visual Studio this is the next step after upgrading and rebuilding a project. Company information: Xpert360 Ltd, founded in 2009, is an Independent Software Vendor and Custom Solution Provider based in the United Kingdom. development ideas, comments, reviews and samples from the Xpert360 development team.